From WNYC’s podcast “New Sounds“, the work of musician/composer and sound artist Neil Burns. It is always exciting to find a new sound artist/composer, and WNYC’s “New Sounds” has a way of doing that. After listening to the podcast I went searching for some of Neil’s work referenced in the podcast. From Neil’s 2014 series Walls Of Sound, here is a sample piece called “Ferryquay Gate to Foyle Street“. The works revolve around recorded sounds from the walled town of Derry in Northern Ireland. They follow a walking path that encompasses the walled city. As part of the work, you receive a map of the artists walking route. The resulting work isn’t just field recording of a particular location. He blends the sounds from his tour to give a sense of atmosphere and underlying pulse to a location. Also from the podcast was Neil Burn’s work “Things That Come After (1)” from his album Mood Music Vol. 1, 2006-2013. A collection Neil’s best ambient and atmospheric chamber music. Earthworks is a five channel computer generated animation, which creates an immersive experience of the phenomena of landscape formation through the scientific and technological devices that are used to study it. Masses of colourful layers are animated by the sound-scapes of earthquake, volcanic, glacial and human activity, recorded as seismic waves, which form spectacular fluctuating marbled waveforms. By using seismic data to control the masses of layers Semiconductor are not only playing with the idea that it is these forces that have shaped landscapes, but also that being an event that occurs beyond a human-time frame, landscape formation can only be experienced through scientific technological mediation of nature. 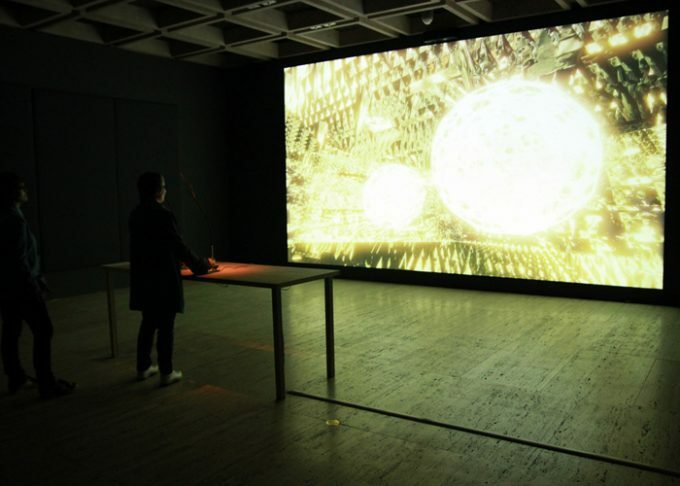 It produces information about time, space and phenomena that no human consciousness could possibly have witnessed. It is as if we are watching hundreds of thousands of years played out in front of our eyes, enabling us to bear witness to events which ordinarily occur on geological time-frames. ‘The Outlands’ is a virtual reality environment that allows the viewer to explore a series of imaginary landscapes using customized control sticks. Built with the Unreal game engine the work has four levels where viewers are free to take their time to look around and explore without fear of assassination. 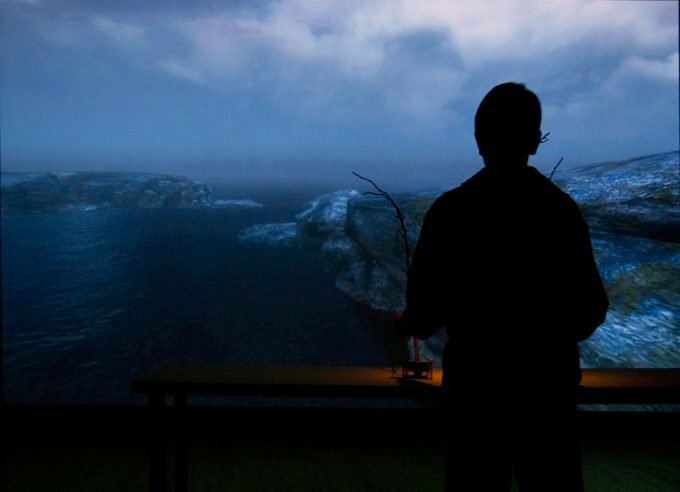 Visitors are invited to take control and conduct their own voyage through an immersive digital world of forests, islands, and futuristic interior architecture. Clasping the tree branches that sit atop a console table, the viewer navigates through each zone, encountering portals into the other worlds configured within the work. While appearing to be a video game, what are startlingly absent are weapons, bodies and aggression. The logic of killing and winning that structures gaming no longer exists, and is replaced with the process of moving through each digital environment and at times suddenly being transported into an adjacent world. Exploratory voyaging becomes the subject of ‘The outlands’ and a close attention to the digital environments portrayed within it. La Selva is an immersion into the sound environments of a tropical rain forest in the Caribbean lowlands of Costa Rica. An astonishing natural sonic web created by a multitude of sounds from rain, waterfalls, insects, frogs, birds, mammals and even plants, through a day cycle during the rainy season. A powerful acousmatic broad-band sound environment of thrilling complexity. And above all, a tour de force of profound listening”. Much against a widespread current trend in sound art and the customary standard in nature recordings, I believe in the possibility of a profound, pure, ‘blind’ listening of sounds, freed (as much as possible) of procedural, contextual or intentional levels of reference. What is more important, I conceive this as an ideal form of transcendental listening that doesn’t denies all what is outside the sounds but explores and affirms all what is inside them. This purist, absolute conception is an attempt at fighting against the dissipation of this inner world.